The village of Glen Ellyn, Illinois, police station was built within the Civic Center four decades ago and has occupied a roughly 11,000 square-foot space since. There were safety and privacy concerns about this shared-space arrangement and Glen Ellyn was well overdue for a new, improved station. In 2011, the village was financially ready to tackle the new station project; a location near village-owned Panfish Park was identified as optimal to meet most of their needs. Dewberry and Leopardo Companies, of Hoffman Estates, Illinois, conducted a site analysis which ruled out the possibility of a basement and identified a flood plain, which the Army Corps of Engineers then expanded two months into the design process. “It turned out to be a big flood plain, therefore we moved the building closer to Park Boulevard, a lot closer to the street than we’re used to," says Jonathan Tallman (AIA, GGP, GPCP), a senior project manager and Dewberry’s regional public safety director in the Midwest. Tallman, who guided the Glen Ellyn police station project, notes this created a 25-foot setback — so they specified signs, bollards and trees to protect the building from a car accidentally jumping a curb. Aside from working around constraints presented by the location, Dewberry typically relies on a site to help lend vision and inspiration to the design of a project. 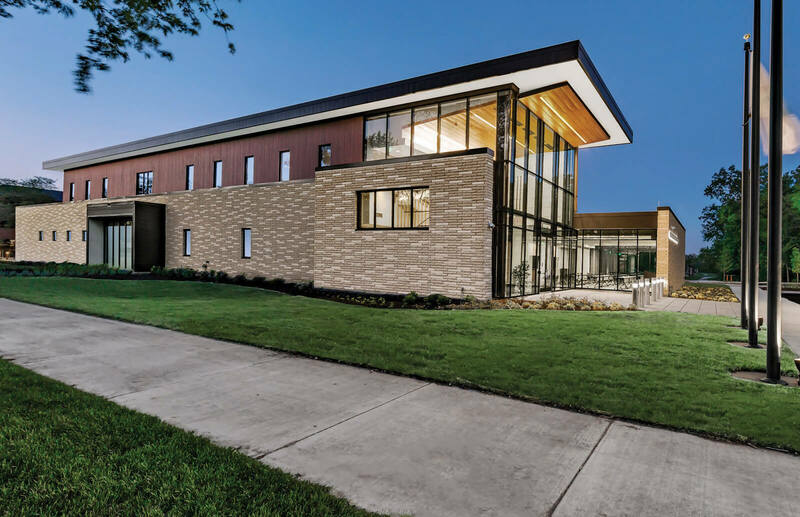 “In the case of Glen Ellyn Police Station, it was a park setting and the station needed to reflect that more natural setting, more so than a typical brick office building would,” says Tallman. Another key site consideration for the building was the fact that it would be visible from all sides and its surroundings were diverse, including residences, a commercial medical office, Panfish Park, and a parking lot. “It was important that the police department look nice from all sides, not just from the front,” says Tallman. For the exterior finish, designers chose a combination of natural stone and wood siding to complement the park. As a cost-saving measure, Leopardo recommended using Echelon’s Cordova Stone™ from Oldcastle APG, A CRH Company, to achieve the natural stone look for a more budget-friendly price. “It was a good cost alternative that will last a long time like stone and look as natural,” Tallman says, adding that a fiber cement board with a wood grain texture was used instead of real wood siding. Leopardo also identified certain walls where they could save costs and increase efficiency by using the InsulTech™ Insulated Concrete Masonry System (ICMS), also by Oldcastle APG. InsulTech uses a load-bearing system instead of steel column framing and infill block. The Cordova stone and a complementary color of Echelon Mesastone® were installed as the face, using the InsulTech System along the north side of the building. 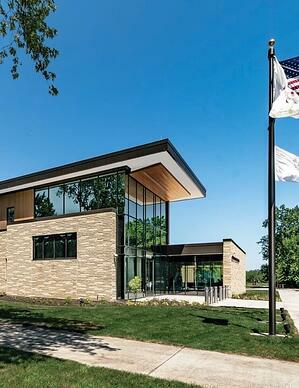 The Glen Ellyn police department moved in to their new 29,000-square-foot facility in June of 2017. “The masonry went up really fast, so it was one of the contributing factors to being done two months ahead of schedule,” says Tallman. With the project running under budget, the village was able to add elements that had been removed from the plan, including a fence, security cameras and storage units. 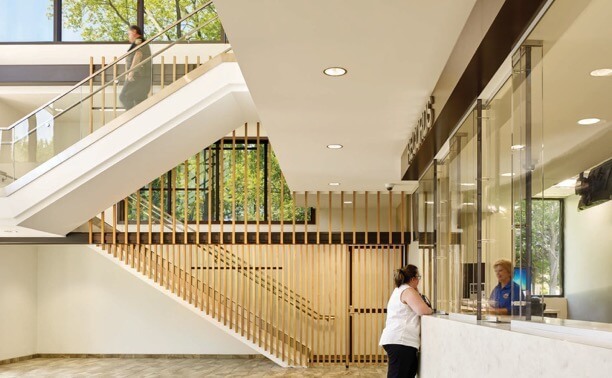 The new police station has a more centralized location in the village, a strategic layout that improved workflow and community access, and design that complements the many natural elements of its surroundings. It now meets both the police and community’s needs and is in keeping with what the village intended decades ago. Visit the Echelon Masonry website to view the full selection of masonry products.